Sarasota is a city located in Sarasota County on the southwestern coast of the U.S. state of Florida. The area is renowned for its cultural and environmental amenities, beaches, resorts, connections to the Ringling family, and the Sarasota School of Architecture. 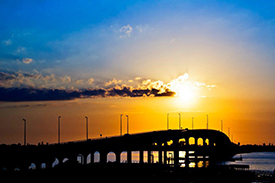 The city is located at the southern end of the Tampa Bay Area, north of Fort Myers and Punta Gorda. Its current official limits include Sarasota Bay and several barrier islands between the bay and the Gulf of Mexico. According to the U.S. Census Bureau, in 2013 Sarasota had a population of 53,326. In 1986 it became designated as a certified local government. Sarasota is a principal city of the Sarasota metropolitan area, and is the seat of Sarasota County.